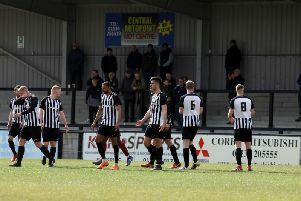 Tommy Wright felt some Corby Town players “let themselves down” after they suffered their first defeat of the season at Whitby Town. A Dale Hopson penalty 14 minutes from full-time was enough to give the hosts a 1-0 success in the Evo-Stik Northern Premier League Premier Division. The loss came after the Steelmen had drawn their opening two matches. And while Wright was disappointed with the decision to award Whitby their penalty, he admitted his team “didn’t do enough to win”. “I don’t want to be someone who berates the officials but I thought the penalty was very soft, the contact was minimal,” Wright said. “There wasn’t a great deal in it. But we didn’t do enough to win the game. “We hit the bar and so did they. We had some chances and so did they but it wasn’t a particularly good spectacle of football. “I thought there were two or three players out there who let themselves down and they haven’t done themselves any favours. “I thought Brad-Lee Gascoigne and Jamie Anton were solid at the back, Reece Webb put a real shift in, Ben Milnes did what he does and Connor Kennedy had a decent game. Wright handed frontman Femi Orenuga his first league start but his afternoon was cut short after a recurrence of the hamstring injury that kept him out of the first two matches. “Femi felt the same thing again so we had to bring him off,” the Steelmen boss added. “He did his rehab and he said he felt okay but you always have to be careful with muscle injuries. The Steelmen, meanwhile, now know they will make the short trip to Rugby Town in the first qualifying round of the FA Cup on September 3. Rugby beat Bromsgrove Sporting 1-0 in their preliminary round clash yesterday.